Conspiracy theories abound as you try uncover the mystery of the Lying Lowe quest in Lewisburg, as you follow breadcrumbs left behind by Shelly Van Lowe. Shelly believed her brother Calvin was devoured by the monstrous Sheepsquatch, and you'll need to track down clues and solve puzzles in order to find out what really happened to Calvin and if this so-called Sheepsquatch still terrorizes the wastes. Simply check out any of the ominous "Sheepsquatch Ate My Brother" posters around town to get started. The Burrows endgame dungeon is being added in Patch 8, but it won't actually open to challengers until next Tuesday, April 16. You'll tread the same ground as Brotherhood of Steel forces who were sent to the subterranean depths beneath Harper's Ferry for unknown reasons - but whatever's down there, you can bet it'll require a tightly coordinated squad and top-of-the-line gear. The Survival Mode beta continues to be fine-tuned before the feature launches in full, and the latest change greatly softens the penalty for death by reducing Aid losses and Caps dropped when killed in PvP. Turrets are also getting a boost to their effectiveness when defending, as they're now affected by PvP scaling, and their damage has been buffed across the board. Death Mechanics: The number of Caps lost when killed by another player has been reduced from double to 25% of that character’s level. For example, A level 60 character who is killed in Survival will now lose 15 Caps, rather than 120. The killer in this case will earn 15 Caps. A Vendor from each faction except the Enclave can now be found downstairs in the shops at The Whitespring Resort. This should help reduce the need to Fast Travel in order to visit multiple Vendor Factions when buying and selling items. This means that buying items from, or selling items to, a Vendor will update the pool of available Caps across all Vendor Factions. This change should offer more flexibility when buying and selling higher-priced items, or when attempting to trade many items at once. Upon logging in, a new screen will automatically display to notify you of the new Fallout 76 announcements, Atomic Shop offers, patch notes, and the latest game-related news. The top of the news screen will display four different items. You can cycle through them by pressing d-pad right and left on controllers, or by clicking on PC. Fermenter. In future updates, we plan to implement more of these types of icons for other new features, such as player vending and display cases. General: Players will no longer encounter a black screen after respawning at Harper's Ferry while wearing Power Armor. 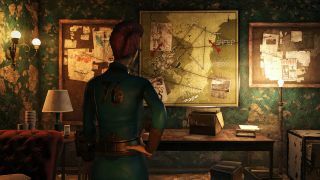 Check out some handy Fallout 76 tips below, then read up on how Brahmin experiments are the new endgame activity that players have invented in Fallout 76.